What to do when your oil moisturizer has failed you. I have a love, hate relationship with oil moisturizers. On paper, they're one of the best hair products ever existed. A perfect hybrid of oil and cream that bathes the hair in moisture. It's exactly what girls with thick, dry hair long for. The only problem I have is they don't deliver as expected. I mean, sure, the hair may respond well when first applied. But then things seem to change. A little time passes and your hair may start to feel greasy. Some oil moisturizers sit on top of the strand causing unwanted build up. The problem with oil moisturizers is that they don't really seem to moisturize. Not long ago, I reunited with the KeraCare brand. After getting my hands on a 5lb bucket of Humecto, I wondered if there were other products from the line that I was missing out on. Sure enough, I tried their sulfate free shampoo and feel in love. I was on a roll. So I thought, what the heck, I'll give their oil moisturizer a go. When I examined the 16 oz bottle, I thought to myself, I'm set for life." Many of the ingredients were natural plant oils so I expected good things from it. But, once again, I was let down. For some reason, whenever I use oil moisturizer, my hair sometimes feels dryer after application. It's the weirdest thing. Once the initial feeling of moisture wears off, my hair seems a bit more brittle. You might say to me, "then stop using them." That's great advice, but I absolutely love the idea of an oil moisturizer. I want access to a heavy duty moisturizer with a liquid consistency that leaves the hair feeling healthy and amazing. Unfortunately, most commercial oil moisturizers don't do it for me. (Actually, I do remember using Motions Oil Moisturizer for a few years so it must have been ok. A small part of me wants to buy another bottle but I'm afraid of being let down again). Instead of purchasing yet another oil moisturizer, I decided to take matters into my own hands. As I stood in front of my dresser, I grabbed a bottle of Aveda's Daily Leave In with one hand and Gleau Oil Blend with the other. Without hesitation I devised a plan to combine the two to create my own oil moisturizer formula. My hair adores these two products so pairing them together seemed like the right thing to do. 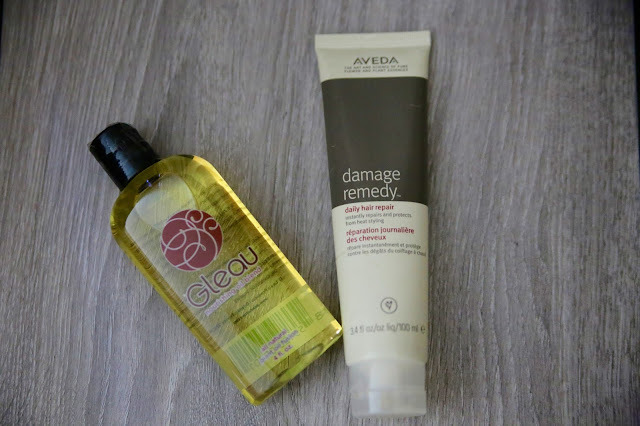 After squeezing a quarter size amount of Aveda's moisturizer into my palm, I saturated it with Gleau Oil, then rubbed my hands together to create a creamy hybrid of the two. I thoroughly enjoyed rubbing the mixture into my hair. Immediately, all signs of dryness and brittleness went away, leaving me with heavily moisturized hair. I felt like my moisture levels had increased 10X. Not too greasy or oily....just right. Gleau is designed not to be greasy on the hair, so it it worked perfectly for my little experiment. And, of course, I adore Aveda's moisturizer which is why everything turned out better than I expected. I should also mention that I'm close to 5 months post so heavier moisture is something my hair craves. I tried this new concoction last night. It's now the next morning and my hair still feels soft and hydrated. Moisturizing and sealing one step at a time is great (L.O.C). But sometimes, you need something a little more powerful to get the job done. It only makes sense to pair two products that your hair currently loves. Your other option is to try an entirely new formula while crossing your fingers hoping that things work out. I think this new strategy will be sensational in the drier months of fall and winter. Anyone else a fan of oil moisturizers? What's been your experience? I personally really love the Lustrasilk Curl Max Activator Oil Moisturizer. I love this stuff, my hair always feels incredibly soft and it's cheap. 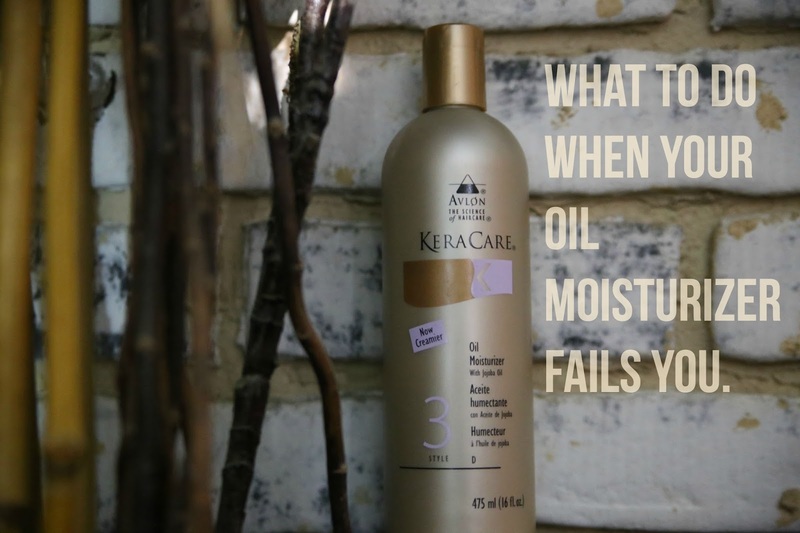 I fell in love with oil moisturizers back when I would self relax with the Optimum Salon Collection. Inside the box was this whipped oil moisturizer that my hair LOVED. This love propelled my inner PJ into purchasing two bottles to my already closet full of hair care products. After the purchase I went home, used the product, and nothing.....it did the exact opposite from my previous experience! I'm sure if the ingredients were changed or what but either way, I was super bummed. I couldn't let another product go to the graveyard; now I mix it with a little JBCO which seems to work. I have the same bad experience with oil moisturizers so I stay away from them. For years, I have sworn by Pinl Lotion oil moisurizer. My hair LOVES the stuff. However, it doesn't work at all with my daughters' hair!